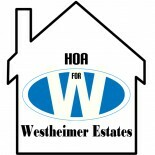 2014 Dues | Homeowners Association for Westheimer Estates, Inc. The Westheimer Estates HOA wishes you a continued prosperous Happy New Year. The HOA, with your participation, would like to help you improve your property value and quality of living for 2014 and the coming years. To meet this goal we would appreciation your timely submission of your HOA dues. As always, HOA dues are due within the first 45 days of each New Year. As we quickly approach this deadline date, we wanted to also offer additional options to help those of you who are not able to make one lump sum payment of $195.00 for the year. We are happy that our dues have not changed for 2014. HOA dues remain $195.00 per year. If you have submitted your annual dues, thank you. If you have not submitted your dues, please take a moment remit your payment as soon as possible. To avoid a late payment fee of $25.00 (which is in accordance with Article I. Section 6, Page 3 of the Westheimer Estates Covenant), please submit your payment of $195.00 by February 15, 2014. This entry was posted on January 8, 2014 by Westheimer Estates in Communication, HOA and tagged dues, hoa, Homeowners Association of Westheimer, westheimer estates.